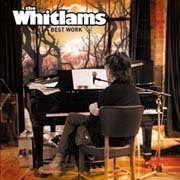 Every Whitlams album needs the big kitchen sink-and-all ballad of love gone wrong, or indeed as in this case, just gone. The second single, “Best Work” is Torch the Moon’s variation on the theme. Which really does round the Heads in a stately cruising manner, with the horns, strings and things and some magnificently over-the-top, heading past George Harrison and heading toward Brian May guitar from the boy Housden. Raise your glass, your bic lighter, and sing along.